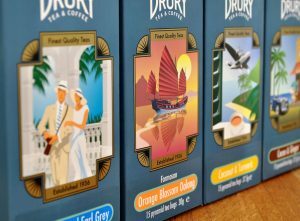 The Drury Tea & Coffee Company, London-based tea blender and coffee roaster with well over 80 years’ experience of buying and blending fine teas, has added to its already extensive range of pyramid teabags with the introduction of four new varieties, Decaffeinated Earl Grey, Orange Blossom Oolong, Coconut & Turmeric and Cacao & Ginger. This brings the total number of varieties in the range to 35, comprising black, green and oolong teas, fruit infusions and herbal teas. 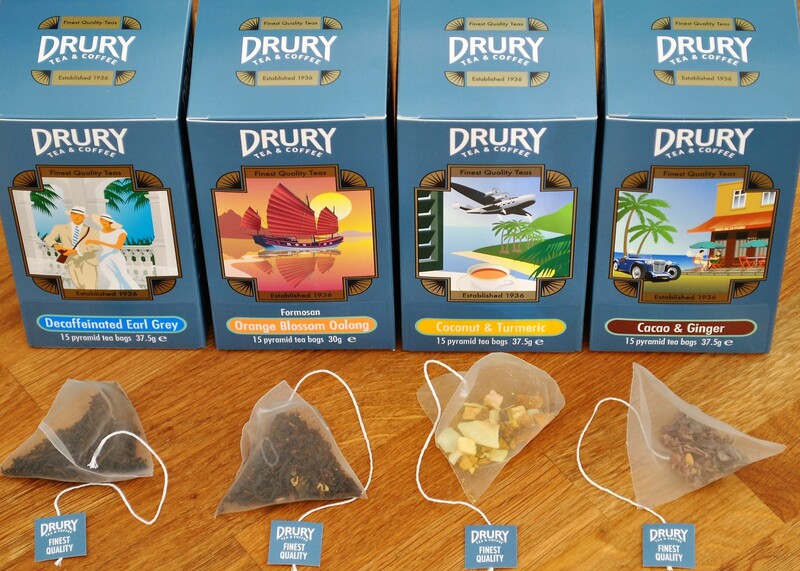 Drury pyramids are made using biodegradable teabag mesh and this material, together with the extra brew space afforded by the pyramid shape, means that the blender can use higher quality, larger leaf teas for better liquoring and a more satisfying taste. The most visually remarkable thing about the teabags is the stunning packaging. Designed with a blue ‘family’ feel, each of the varieties is differentiated by an Art Deco-style illustration relevant to the respective tea type. The design evokes the mood of the thirties when The Drury Tea & Coffee Company was founded. Decaffeinated Earl Grey – Finest large leaf decaffeinated tea scented with natural oil of Bergamot. This delicious blend is almost the same as Drury’s famous Earl Grey with one crucial difference – most of the caffeine has been removed. With its delicate citrus flavour, it is satisfying with or without milk. Orange Blossom Oolong – A delightful oolong tea rich with the heady scent of orange blossom. This tea should be sipped slowly to fully savour the delicate citrus flavour of orange petals, which is perfectly balanced with a light liquoring oolong (semi-oxidised) tea. Serve without milk. Coconut & Turmeric – A vibrant blend of fruit and spices, delivering the flavour of coconut and turmeric. Real turmeric is skillfully blended with raw and roasted coconut, cinnamon, cardamom and ginger, giving this tea a delicate and balanced spiciness that is gently warming and refreshing. Serve without milk. Cacao & Ginger – A subtle infusion of raw cacao nibs, blended with honeybush and ginger. With delightful notes of chocolate, ginger and a hint of orange citrus, this mellow infusion is both delicate and intense. Serve without milk. The newcomers join an eclectic range of black teas, green teas, tisanes and infusions that already make up the Drury pyramid range of speciality teabags. Cartons each contain 15 teabags and are packed six to a case. The carton price of the new teas is from £2.95. Alternatively, for convenience and cost saving, all four new varieties are available in bulk catering packs of 100 from £16.20.